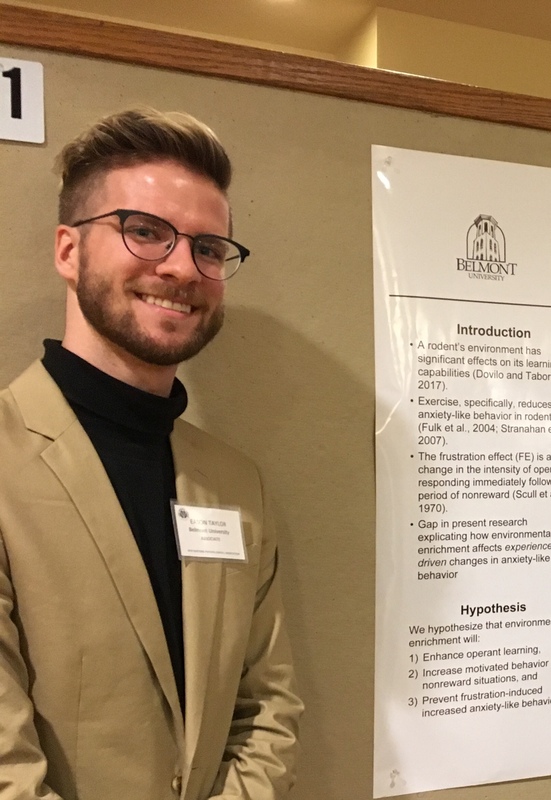 Eason Taylor, a psychology major, was recently awarded a Spring Undergraduate Research Grant of $1,500 from Psi Chi, the International Honors Society in Psychology, with faculty sponsor Dr. Timothy Schoenfeld, assistant professor of psychology. They will conduct research this summer as part of the Summer Scholars Communities program. The project, entitled “Examining the Effects of Exercise on Frustration-induced Anxiety-like Behavior in Rats,” seeks to investigate whether voluntary exercise prevents increased anxious behavior in rats following induced frustration from learning tasks. Eason plans to look at how stress hormones and neuron growth in the prefrontal cortex mediate these effects. This research can help shed light on how natural behaviors, like exercise, can help prevent experience-driven negative mood states.